Earn $1.89 in VIP credit. Click to Learn More. 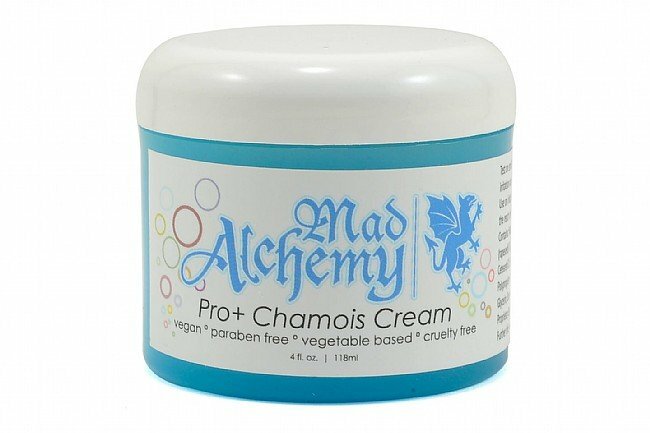 Mad Alchemy's Pro Plus Chamois Cream is made from all-natural, plant-based ingredients to provide superior protection from chafing and irritation. It be can be applied before riding to a chamois or directly on the skin for maximum lubrication, and it can also be used post-ride to stave off saddle sores. Unlike other chamois creams, Pro Plus has a smooth feel that isn't gooey or gummy, and the incorporation of essential oils gives it a pleasant herbal scent. 120 ml jar. Vegan, perfume-free, and petroleum-free. Not tested on animals. It's pretty thin... I would say it's not not as thick or long lasting as Assos. It also transfers through the chamois and onto the outside of my bib shorts which leaves an oily blotch on the saddle. The ingredients are great, and I like that it's not petroleum based. I think it could just use a little refining.